Andrei Gavrilov is one of the most prestigious piano soloists of the contemporary concert stage. Audience response to his performances is remarkable, the reviews ecstatic  and such has been the case since 1974, when, as an 18-year-old, he jumped in at the last minute for Svjatoslav Richter, who had been taken ill. His career since then can only be described as exemplary, with appearances at large festivals, performances with famous directors and many accredited prizes and awards as its high points. In recognition of his contribution to society, he was honoured in 1995 by the Board of International Research of American Biographical Institute (ABI) and received their Man of the Year commemorative medal in addition to the Gold Record of Achievement and World Lifetime Achievement awards. In 1998, the Philips Music Group included Andrei Gavrilov in their exquisite Great Pianists of the 20th Century collection. The paths that led Andrei Gavrilov to Frédéric Chopin are as easy to trace as those that led him to Johann Sebastian Bach, whose Goldberg Variations are among Gavrilov's most favourite piano interpretations. That Beethoven, Mozart and, above all, Bach were, in turn, all role models for Frédéric Chopin is common knowledge. Subtlety of expression, a lyrical rendering, highly nuanced dynamics and the internalized tempo rubato are all characteristic of Gavrilov's piano. The harmonic and tonal reminiscences in Chopin  the legacy of Slavic folk music  make for yet another moment of animated interpretation. At the same time, the clarity of expression and intensity of feeling join forces and become mutually inspiring. Gavrilov's performance begins with Chopin's later work, the Piano Sonata No. 2 avec un marche funèbre in B flat minor, Op. 35. Chopin patron Robert Schumann once remarked that this particular piece was more of a mood than a sonata because it bound most of Chopin's “unruly children' together: an animated rhythmic theme at the start, moving into a demonic scherzo that is followed by the celebrated Marche Funèbre (which the composer had published earlier) and then a mysterious Finale Presto. Yet, despite all the contradictions evident in composition and interpretation alike  from passionate and demonic to melancholic or to an elegant and formal restraint  the overall structure of this piano sonata is logical in its elements of melody, harmony and theme, while its interpretation by Gavrilov is simply intoxicating. An early ballad in G minor, Op. 23. from 1831, Chopin's first, is followed by his last, Op. 52 in F minor and written in 1843, six years before the composer's death. This has a concentrated lyricism that is typically Slavic. Originally dedicated to Baroness Rothschild and based on the tale of The Three Budry Brothers, it constituted a new music genre at the time and was introduced to instrumental music by Chopin himself. The piece draws its charm from arabesque ornamentations and certain variations and developments of these. Contrapuntal aspects, a predilection for blurred intermediate tones and the mysterious themes sit well with the brilliant clarity of Gavrilov's piano. 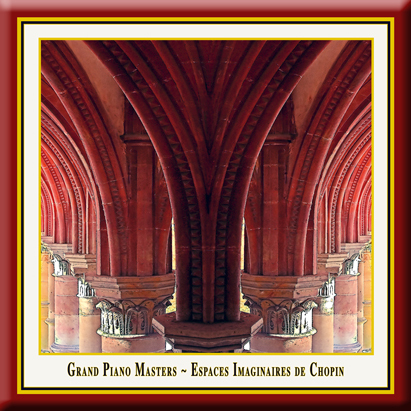 This is an impressive performance from a great virtuoso of the piano, held in the Lay Refectory of the medieval Maulbronn Monastery. It is followed by five of Chopin's concert etudes, “classical forms' that concentrate particularly on the technical aspects of compositions for the piano; in this particular rendering, virtuosity and expression complement each other superbly. The latter two qualities are instantly recognizable as hallmarks of Andrei Gavrilov's art and they round off this virtuoso performance. At the same time, this particular recording is impressive because artist, audience and sound engineer are, so to speak, all in the same boat: the tangible concentration on playing the instrument, the breathlessness of those listening and the precision of the recording technique all merge into a dynamic filigree of sound. Andrei Gavrilov was born in Moscow in September 1955 into an artistic family; his father was a great Russian painter, his mother a pianist. In 1961 at the age of 6 he entered the famous Moscow Central Special Music School which produced all Russian stars. In 1974 at the age of 18 Andrei Gavrilov won the first prize at the famous Tchaikovsky competition. In the same year he made his international triumphant debut at the Salzburg Festival, where he replaced Sviatoslav Richter. Since that time he enjoyed a distinguished international career which has included many of the world´s greatest orchestras. Gavrilov made his London debut in 1976 with Paavo Berlund and the Bournemouth Symphony Orchestra in the Royal Festival Hall. From that time on he has become a regular guest in the United Kingdom. In 1979 Garvrilov performed all over Europe in collaboration with Sviatolslav Richter. Herbert von Karajan invited him for recordings and performances with him and the Berlin Philharmonic. Knowing the political position of Gavrilov, who was opposed to Soviet regime and spoke out his views openly in countless interviews, Brezhnev an Andropov made the decision to put this enormous career to an end. Later Gavrilov discovered that his phisycal elimination was also considered. On December 6th 1979, the day of the concert and recording with Herbert von Karajan and the Berlin Philharmonic, which was supposed to be one of the first digital recordings in the world, Gavrilov was stripped of his passport. His telephone was cut off and the Soviets didn't even inform Mr. Karajan that Gavrilov would not appear in Berlin. Karajan was waiting for him for four hours to rehearse and then cancelled the concert which caused a big scandal in former West-Berlin. It was the beginning of a five year deadly confrontation between one man and a totalitarian state. In enormously difficult circumstances, in total loneliness (nobody was allowed to communicate with Gavrilov) he was continuing to practise and working on his musical perfection. He was threatened to be put into psychiatric clinics, being expelled from Moscow etc. During those times there were several attempts to take his life. All this led the musician to severe nervous disorder and after several strong attacks of heavy hyperventilation he almost totally lost his ability to move without somebody´s help. He was practically learning to walk a new with the help of a special training system and showed the enormous strength of his character. In 1984 Gavrilov succeeded to deliver his letter, asking permission to go to the West, directly to Gorbatchev, who by that time was practically ruling the country. In the same year he was allowed to visit London twice, where he played enormously difficult programmes and made many recordings. In February 1985 he again went to London for recording sessions and through private sources started to negotiate with Gorbatchev the fact that he had to stay in the West for the rehabilitation of his health which was in serious danger and try to rebuild his ruined career. He succeeded to convince Gorbatchev. At the same time Gavrilov was asking Gorbatchev to not allow Russian bureaucracy to provoke him to make any political statement like political asylum or defection. The dream of Gavrilov was to become the first Soviet artist who could freely travel around the world and make this normal for all other Soviet artists. This wish was supported by Gorbatchev, who by that time had become the General Secretary of the Soviet Union. He only asked Gavrilov after some time to come back to Russia, because Gorbatchev badly needed to convince the KGB, that Gavrilov was not a political defector and would keep his word. From 1985 Gavrilov started working hectically on all major western concert platforms. Based in London he practically spent 1985 and 1986 in the USA because the States was the only country he didn´t visit in the seventies. A huge tour of 52 concerts in USA was already planned in 1980 but due to his ban on travelling this tour was given to several artists including Ivo Pogorelich. He took New York by storm after his first appearance in Carnegie Hall in June 1985 with an all Chopin programme after which he was proclaimed a major artist by Donal Henahan of the New York Times. This debut was followed by huge tours to practically all major cities in the United States. American musical circles were seriously disturbed by the enormous impact of his performance in the USA. New York Times had started polemics about the abnormality of Gavrilov´s success, saying that he was making his career in cinematic proportions. This campaign produced a lot of difficulties in getting concerts in the USA for Andrei Gavrilov in the 90ties. At the same time Gavrilov participated in many charity concerts. He was a driving force behind the famous Armenian earthquake concert at the Barbican Hall, which was the first concert dedicated to the victims of the earthquake just three days after the catastrophe. The concert started at 11.30 p.m. and lasted three hours with the participation of Rostropivich and other celebrities. The concert was attended by the Royal Family. 500.000 £ were collected and sent to Armenia. It was a very moving and touching event. The concert was recorded and all records were sold within two days. After the Chernobyl catastrophe Gavrilov was also participating in several concerts dedicated to it. Enormous concert activity combined with almost non-stop recording sessions at EMI studios produced a lot of successful recordings, many of which were awarded with the highest prices. At the end of 1987 Gavrilov came back to Russia keeping the word given to Gorbatchev. He continued his concert activity from Russia with the same intensity and professionalism. Eventually his dream came true. He had become the first Soviet artist who achieved the possibility to be a free man in the full sense of this word. And after his example all Soviet artists automatically followed. It was a great humanitarian achievement. After one and a half year which Gavrilov had spent in his beautiful villa near Moscow, he came to the conclusion to leave the country in which he had suffered so terribly. His last political wish was to make a example of coming back to his colleagues who were persuaded to immigrate in the sixties and seventies. Particularly it was a come back of Vladimir Ashkenazy with whom by that time he had been working together in the West and who was his great friend. Gavrilov started a campaign in Russia with the help of TV to prepare the public mind. Then he negotiated with gouverment officials the possibility of Ashkenazy´s appearance in Moscow. It was another humanitarian victory. In November 1989 Ashkenazy came with the Royal Philharmonic Orchestra to Moscow and played one concert himself and in a second concert Gavrilov accompanied him at the second Piano Concerto of Rachmaninov. This event was recorded and is available on video cassettes and CD. Gavrilov enjoyed sharing beautiful moments with Ashkenazy´s Family who stayed with him in his spacious house. In December 1989 he felt terribly tired of the political turbulence of ten years of his life into which he was thrown by destiny. He left Russia forever and he wants to dedicate the rest of his life entirely to the art which he couldn´t do because of all above. Gavrilovs recordings have been awarded several international prizes, including Gramophone (1979), Deutscher Schallplattenpreis (1981), Grand Prix International du Disque de L´Acadèmie Charles Crois (1985, 1986), International Record Critics Award (IRCA, 1985). In 1989 he won prestigious Premio Internationale Academia Musicale Chigiana (Siena), which proclaimed him the best pianist of the world of 1989. The jury consisted from major music critics of the world. In 1995 due to recognition of his contributions to society he was honoured by the Board of International Research of American Biographical Institute (ABI) receiving the "Man of the Year Commermorative Medal", one of the 20th century´s most recognisable award of success "Gold Record of Achievement" and World Life Time Achievement Award.